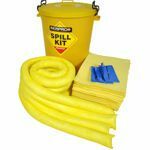 When it comes chemical spills you need to know you are using the best Hazmat Absorbents for the situation. The SERPRO Hazmat absorbent pads for potential chemical spill environments are an excellent choice as part of your spill control contingency plan. SERPRO chemical and hazmat absorbents have a high resistance to acid and base type spills and will perform in the most aggressive spill environments. Specifically for use with chemical and hazardous liquids. 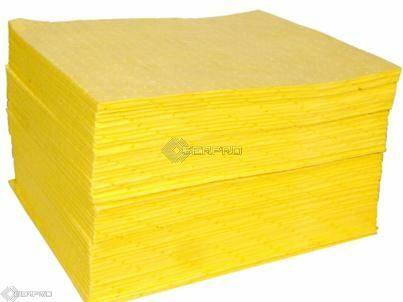 Industry standard bright yellow colour to indicate hazardous material. Use in all areas of chemical plant and chemical manufacturing. Ideal for hazmat spill cleanup, spill containment and chemical response spill cleanup. SERPRO chemcial spill response absorbents are effective for even the most aggressive fluids - Including hydrofluoric, sulfuric, nitric, phosphoric, hydrochloric acids and other harsh chemicals and provide superior performance without product degradation.